When Rashi Chopra, a Delhi-based birthday party organizer, includes basic aeromodelling session as part of a birthday bash, she has more than children on her hands. “It is tough to keep fathers away when such an activity takes place," she says with a laugh. “These basic aeromodelling sessions are hugely popular and the concept has really picked up in last year or so," says Chopra whose company, Full of Life, conducts these sessions at parties for children aged 7 and above. Each child gets an aeroplane kit, which they have to piece together, and then, they get to take the finished aeroplane home as a return gift. On an average, Chopra charges Rs200 per kit. Aeromodelling is the art of making powered and non-powered replicas of aircrafts using materials such as Balsa wood, foam and fibreglass. The models can be of both kinds—flying and non-flying. Flying models usually are of three kinds: free-flight models (with only built-in controls), control-line models and the very popular radio-controlled (R/C) models. Earlier, this hobby was a only rage among engineering students but now, thanks to availability of simple aeromodelling and R/C models, more and more teens are taking up the hobby. “This is an expensive hobby. 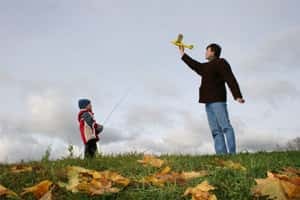 Children needs some basic training before they can get started," explains Rakesh Verma, an instructor with the Indian Aeromodellers Club, Virar, Mumbai, whose next workshop is scheduled during the Christmas break. “School vacations like the winter break work out best to conduct a three-four-day introductory session. Only children who are really keen should opt for more advanced courses." While a few aeromodellers may scoff at a “juvenile" introduction to this hobby at birthday parties, veterans such as Verma and Delhi-based H.S. Kalsi say that any form of initiation is good. Kalsi gives private lessons to children who are 13 or older near Gurgaon. “It’s best to start with trainer models made with Balsa wood," he says. Another starter model to practice with is the Catapult Glider, which teaches children how to give shape to an aeroplane and understand the basic aerodynamics in the process. “Apart from the thrill of making an aeroplane, aeromodelling teaches children to concentrate better and also makes it easier for them to understand basics of physics," Kalsi adds. He is not so fond of Almost Ready to Fly (ARF) kits for beginners. “The biggest disadvantage with ARF kits is that if, for some reason, the plane is not able to fly, the child won’t be able to figure out the reason behind the failure," he says. Verma, who takes courses during vacations for kids above 12, concurs. “We provide children with a blueprint, Balsa wood and teach them how to make an aeroplane model from scratch," he says. “We also give information about aviation, fuselage and introduce principles of aerodynamics." At Verma’s classes, children start with models that have to be “chucked" to fly and if these fall flat, they know the proportions are incorrect. It’s only after the children have a solid grasp of the basics that Verma allows them to participate in a 10-day course where they learn to build an R/C aircraft that can go as high as 200-300ft. There are constraints though. High cost is one, felt keenly since beginners’ models work on trial and error. While Verma’s three-day workshop is easy on the pocket at Rs800, the 10-day advance course with an R/C kit can cost up to Rs12,000. Finding a suitable space to fly the models remains a problem in metros since engine-powered airplanes make a lot of noise and most models need an unobstructed area to fly. “Don’t try this on your terrace or your local park, specially with R/C models," warns Kalsi.